Rinna has always lived in the forest with her mother and many brothers. Theirs is a big, loud family, and Rin enjoys the simple forest life, frequently taking comfort in the trees that surround her. But then something changes, and the trees seem to be reminders of self-loathing and hate, and Rin feels disjointed. So when her brother Razo comes home for a brief visit, she returns to the city with him and the Tiran ambassador Dasha to work for the queen. Isi and Enna and Dasha, whom Rin calls the Fire Sisters, and their strange powers impress and excite her, and though Rin feels small and insignificant in comparison, she is drawn to them like a moth to the flame. But when trouble in the east threatens Isi and the royal family, Rin travels with the Fire Sisters to investigate. There they discover an unexpected and powerful enemy that threatens not just the Fire Sisters and Rin, but the entire nation of Bayern as well, and Rin must learn to face her fears and discover her true strength. Shannon Hale's novels are always delightful and lovely. They're brimming with magic and strength and love, but also contain elements of danger and powerful villains that keep her stories lively. But always readers read through her books knowing that they will have a satisfactory ending, and they do not care about this knowledge—Hale's novels are just that enthralling. However, in Forest Born, readers will be blown away by the suspense and surprising plot twists that make for a harrowing and gripping read that will make you doubt the outcome of the story. Rin is a smart, resourceful character, but after her first disappointment in love and the confusion concerning her abilities, she's left uncertain and self-conscious. Throughout the story as she observes and aids the Fire Sisters, she does slowly emerge from her shell and begin to find confidence and understanding in her abilities, which is one of the major themes of the book. Hale also skillfully builds upon older characters, which is enjoyable as it's always fun to drop in and check on older characters. 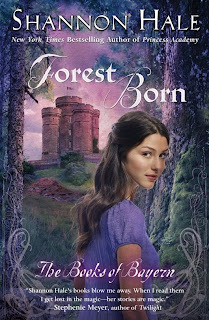 Their humor and quirks, added to Rin's journey of self discovery, makes Forest Born an exciting, witty, and completely enthralling read. Fans of the Books of Bayern will certainly not be disappointed, and will be happy at the satisfying, but open, ending in hopes for yet another Bayern book to immerse themselves in. Cover Comments: I do like this cover, with all mof its purple tones and the pretty fonts used. Though I do prefer the older style of covers this series has, I do think this is pretty, and perhpas more befitting of the younger teen audience. I've been meaning to read the rest of the Bayern series...and now there's another. It's going to the top of my to-do list! I know someone who will LOVE this!! I agree about the cover--I much prefer the older style. The newer style might appeal to the young teen reader, but I would never pick it up. Thus I would miss out on a grat author.